You’re looking at a computer screen. Pixels are glowing and changing before your eyes, creating patterns that your mind transforms into words and sentences. The sentences and ideas are in your mind (and mine, as I write them), but the computer, the server, the pixels, and your eyeballs are all real objects in the real world. Although realism is extremely popular with both professional philosophers and non-philosophers, it’s actually very difficult to justify logically. It’s notoriously difficult, for example, to prove logically that you’re not dreaming, or not in the Matrix. Of course, it’s at least as difficult to prove logically that you are dreaming or in the Matrix, and these difficulties have created room for a variety of philosophical debates. Realism is often contrasted with idealism. Realists and idealists disagree on whether the objects around us are “real” (outside our minds, in the world), or whether they are simply ideas. *Note that this distinction has nothing to do with the popular sense of these two terms. In popular culture, an idealist is someone who believes in high ideals like justice, goodness, and beauty, whereas a realist is someone who does not believe in such things and just tries to deal with “grim realities.” In philosophy, the terms are not used this way. Realism is a far more simple and direct idea, and nearly everyone outside of professional philosophy is more of a realist than an idealist. This is most people’s common-sense view of the world. We use our senses to gather information about real objects that are around us. Those objects are really out there, and they have physical properties that we can sense – they reflect light for us to see, or they emit odor particles for us to smell. 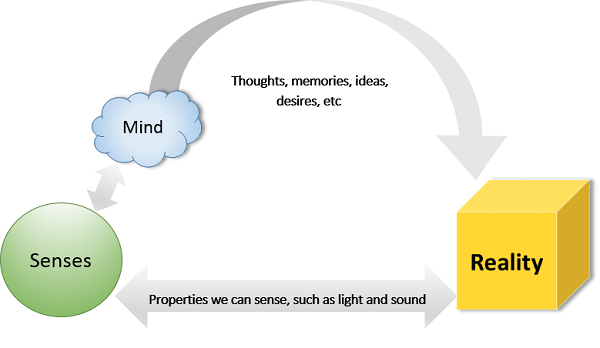 Then the mind directly connects with these objects through memory, thinking, etc. Reality is a collection of objects that we sense. Idealists reject this picture of the world. They argue that the universe is not a collection of objects that human minds can perceive, but rather a collection of ideas that human minds can grasp. All physical objects, they say, are manifestations, or a kind of physical clothing on top of the idea. When you see a football arc through the air into the receiver’s hands, it’s following a mathematical trajectory called a parabola. Idealists would say that the ball’s path is “manifesting” the abstract idea of a parabola, so what’s really “real” is not the ball or the air or the stadium, but the ideas that all these things represent. Some idealists take a more radical position, arguing that there are no physical objects at all, only perceptions of physical objects. 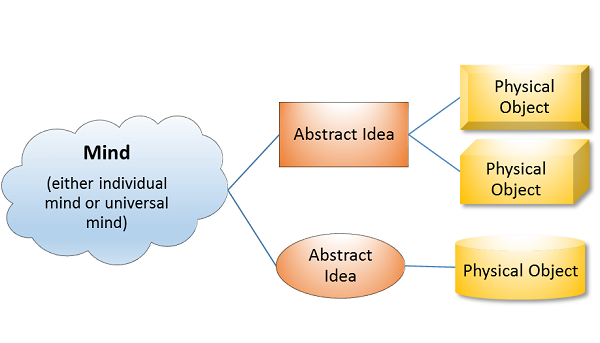 All idealists agree that the world around us is made of ideas – but while some argue that the ideas are part of a universal mind (e.g. the mind of God), others argue that the ideas are part of an individual mind. Most students find idealism (in either form) a little difficult to swallow – it’s so different from the way we normally think about the world, it almost seems crazy! But it’s a little easier to understand idealism if we look at the grey area in between realism and idealism. As with most philosophical controversies, this one isn’t black-and-white. Most scholars fall somewhere in between total realism and total idealism. In addition, you can be a realist about some objects and an idealist about others! For example, some philosophers are realists when it comes to everyday objects like shoes and sandwiches, but idealists when it comes to ethics or consciousness. In addition, idealists point out that perception depends on the mind, which means ideas will always interfere with our perception, and this is something that idealists and realists can agree on at least to some extent. When you see a car, for example, idealists argue that you’re not directly perceiving the car but rather perceiving it through a kind of lens or fog imposed by all your knowledge, ideas, and associations related to cars. Thus, our ideas are like colored glasses that can never be removed – they distort everything we see and make it impossible to sense the world reliably. This is a point that even a strong realist can accept – even if you strongly believe in realism and argue that there is a real world out there, you can still agree that perceiving that world is a complicated process involving both reality and ideas. In this way, the difference between realism and idealism is really a difference of degrees – there’s a spectrum between the two, and most people fall somewhere in the middle. In this quote, mathematician Martin Gardner offers one version of the most popular argument for realism – it just makes sense. And, more importantly, it helps other things make sense. Without realism, it would be difficult to explain why the world appears to be so real, and this is in fact why nearly everyone is a realist to at least some degree. But notice that Gardner doesn’t try to prove that realism is true – he only argues that it makes more sense than the alternatives. Realism, according to Gardner, is not a watertight logical fact, but only a reasonable conjecture – a good guess. This quote has been floating around on the internet for years, usually attributed to the writer Gustave Flaubert. If Flaubert had said it, it would be a very bold example of anti-realism. He didn’t say it, but he did say something slightly similar – though much more complicated and difficult to interpret. Flaubert was a kind of idealist, but he didn’t deny the existence of reality, only its value for art and life. He argued that beauty and goodness often come from distorting or playing with reality, not from slavishly imitating it. Realism vs. Idealism is one of the oldest debates in philosophy, dating back to Classical Greece and probably to much older religious and spiritual traditions around the world. According to the traditional story, it created a rift between the Greek philosopher Plato and his star pupil, Aristotle. Plato was an idealist, arguing that our world of physical objects was merely the shadow of the true world, the world of ideas (Plato called them “forms”). In Raphael’s famous painting, The School of Athens, the great painter depicts dozens of philosophers all arguing and talking together on the steps of a huge marble archway. 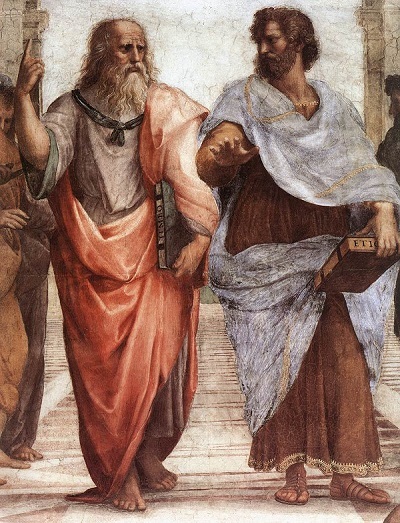 In the center of the painting, Aristotle and Plato are standing together, and they’ve been interpreted as arguing about realism. Plato is pointing up toward the sky, toward the realm of abstractions and forms, of which our world is merely shadows. Aristotle, in total disagreement, is gesturing toward the ground, arguing that truth is right here, all around us. The Matrix constantly deals with the ideas of realism and anti-realism. It takes its inspiration from one of the most famous critiques of realism, namely the possibility that everything we see might be a dream, an illusion, or a simulation. However, The Matrix is arguably more of a realist film since human beings are capable of escaping from the illusion into a gritty reality. Some idealists would argue that we cannot escape the illusions or see around them because the very act of perception depends on ideas rather than objects (see section 2). The Truman Show is another film that explores the limits of realism by asking what it would be like to live one’s entire life in an illusion. In this case, the illusion is all of Truman’s life – his friends, his job, his home, even his family, are all actors in a global TV show. As the idealists like to point out, our perceptions are extremely unreliable – perhaps so unreliable that we can’t even trust that our own lives are real. Which quote is an expression of philosophical realism? a. Morality and beauty are just words. You should live in the real world instead of being naïve and idealistic. b. Reality exists outside of the mind. c. The purpose of art is to depict reality as accurately as possible. You have a really nice blog here. It explains the philosophies in ways that my non philosophical mind could understand. Thanks. Please keep it up!